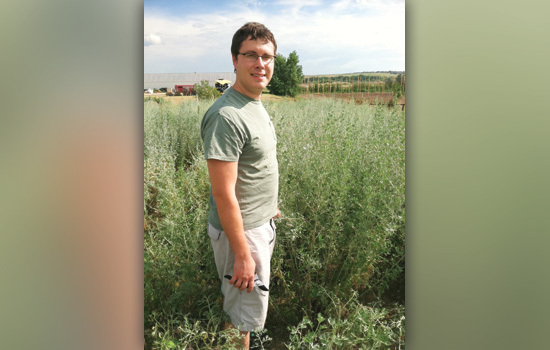 Joseph Pawelski ’06 opened Overland Distillery in Loveland, Colo., in 2009. Ever since his father gave him his first model rocket when he was a child, Joseph Pawelski ’06, ’07 (mechanical engineering, thermal fluids engineering) knew he wanted to be an engineer. But he could never have predicted that he would become a leading producer of an alcoholic drink that was once banned in the U.S. and many other countries worldwide. A husband and father of two with a third child on the way, Pawelski works as a technology manager for Advanced Manufacturing Technology in Loveland, Colo., where he develops equipment for craft breweries and designs production lines for beverage companies like Coca-Cola and Pepsi. And he is a professional distiller in his spare time. Pawelski opened Overland Distillery in 2009 with his wife, Amanda, whom he met while studying at RIT. Their first and only product, Trinity Absinthe Superieure, sold approximately 1,200 bottles last year and has won numerous awards. 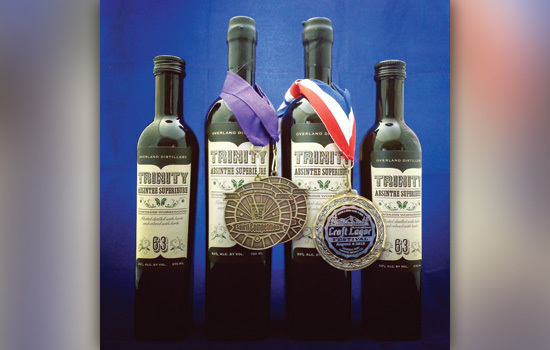 Among its many accolades, Trinity Absinthe won silver in the 2014 San Francisco World Spirits Competition, silver in the 2014 Fifty Best Tasting and double gold in the 2012 Denver International Spirits Competition. Absinthe is a highly alcoholic spirit made from wormwood, anise, fennel and other herbs. The drink has often been linked with hallucinations and was banned in the U.S. and other countries due to concerns regarding thujone, a chemical present in wormwood that can be dangerous in high volumes. However, after scientific studies debunked these claims, the U.S. lifted its ban in 2007. Pawelski chose to produce absinthe because of the drink’s rich history among artists and writers and also because he enjoyed the complex nature of its distilling process. Unlike many other spirits, absinthe is distilled with herbs. The resulting mixture is then colored, diluted and aged before being bottled. “The process is similar to making a really strong cup of tea,” Pawelski said. Trinity Absinthe is currently distributed in Colorado, Illinois, Massachusetts and Virginia, with limited availability in Maryland and D.C. Overland hopes to expand its distribution to more Northeastern states, including New York, New Jersey and Connecticut. Pawelski credits his success to his passion for invention, the skills he acquired at RIT and to his wife, who manages the distillery’s business operations.